When I first started doing school visits, I was uncertain, trying to figure out what to do and why. That’s when I had a near encounter with a yo-yo. I went to a rural elementary school a week after a yo-yo company had performed at the school. 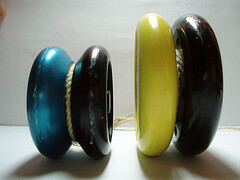 The yo-yo people had charged the school $1000 to perform, and then got to sell yo-yos, too. The school paid me nothing as an author to visit the school and present my children’s picture book. Author v. yo-yos and the Yo-yos won. Heck, I even had to pay for my lunch that day. I thought about that many times since then. The educational value of my presentation: literature, literacy, writing, reading. Foster reading and writing by making it fun, easy, accessible. I often do small group writing sessions with students. My favorite is when the students are some of the most discouraged about writing. This month, I got to teach a class of mostly discouraged writers. We drew a map, wrote specific name places, and imagined the setting. Then, students put a finger on the map and moved around the map while telling a partner a story. Then they put their finger on a different place on the map and told the story a different way (revision in the oral stage!). Finally, they wrote their story. At the last, I asked for a volunteer to read and one girl immediately responded and read a great story. Yes, there were misspellings and a few grammar mistakes she needed to correct later; but the story was great. Teachers later told me they were astounded that this particular girl volunteered to read, because she was so shy. Confidence and joy in her writing, that’s what the girl gained that day. Yes, it’s easy for me to come in and do a one-shot boost for a kid like that. It’s harder to do the day-to-day grind of preparing her for testing. But maybe, that one day of confidence and joy will carry her through the testing. Help teachers enjoy reading and writing with kids even more. Teachers enjoy the enthusiasm that students have for books in the preparation for my visit, during my visit and in the aftermath. It’s a time to break the mold and have fun. Help school community celebrate literature, something too seldom done! Several years ago, I was asked to speak at a fall reading kick-off at an elementary school. The theme for the school’s fall reading was travel and my book, The Journey of Oliver K. Woodman was perfect way to start the excitement. The librarian was amazing! When I walked into the school auditorium, every kid was waving a tiny American flag. They sang patriotic songs and were already studying large US map displayed in the library. Now, I’ve been to sports pep rallies and they are fun. But a pep rally for reading? This was fantastic. The entire school – led by a librarian, par excellence, supported by enthusiastic staff and administration – was building a culture around a celebration of literature, reading, writing, literacy. Amazing. And still too seldom seen. I’m no longer bashful about charging for school visits. Yo-yos are fun for a day and quite entertaining, no doubt. But as a writing teacher and author, I remind myself that I also have something of value to bring to a school. I take it seriously and work harder during a school visit than I do any other time. Why? Because one shy girl volunteered to read her story. And at the end of an hour of playing with words, she smiled.